I nearly missed this postcard in the collection. It’s another from the city of Portsmouth, also printed in Germany with no writing on the back. 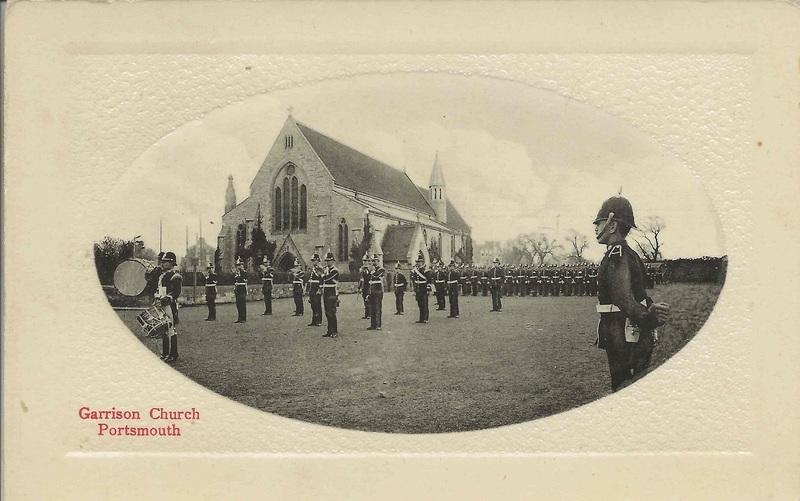 It shows the Garrison Church, with a military or constabulary unit in the foreground, standing at attention. It made me pause and look a little more closely at Portsmouth. Harold and Walter obviously spent some time there and the place impressed Harold enough to send three postcards home about it. What made this place so fascinating for our 18 year old ancestor in mid-1914? I’ve never been to Portsmouth and while I knew it was both a recreational destination and a port, its story is much richer than that. It has a very long and important history as a naval base and is still home to about two thirds of the Royal Navy’s fleet. It also had a long and illustrious history as a ship-building city; once employing more than 20,000 people in the industry. Portsmouth, in 1914 was growing rapidly; its population was just under 250,000. 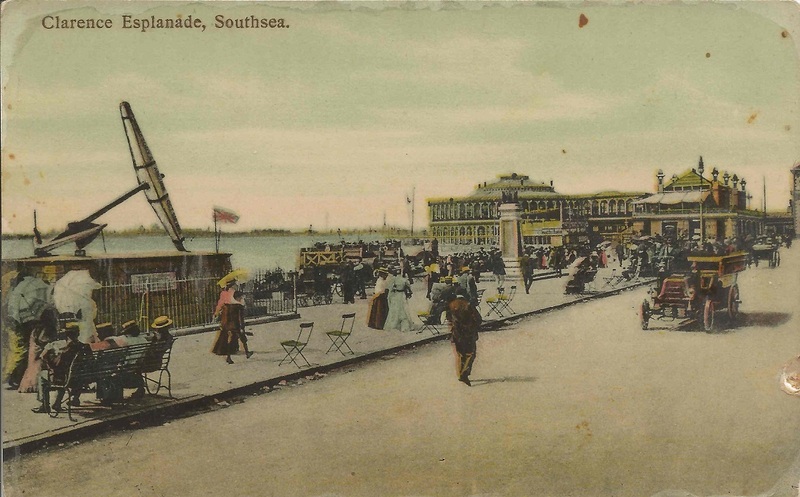 In June 1914, It must have been a lively place — a jolly place as Harold said — with plenty of people flocking to the seaside looking for things to see and do. There must have been naval activities happening too and I want to find out more about those, but first I want to find out about the sites that inspired the postcards home. The Church Garrison in the postcard photo is one of the oldest buildings in Portsmouth, dating back to 1212. It was a built as a hospice and shelter for overseas pilgrims on their way to Canterbury (Domus Dei). Inside the church, there are hundreds of memorials to England’s better known naval and military figures (and other notables) such as Lord Nelson and the Duke of Wellington. Sadly, during WWII, the roof of the nave was lost and never replaced. Many of these memorials are now deteriorating. I can imagine Harold and Walter among the many tourists leaning in, looking closely, pointing at the historical names they recognised, reading up in the guides about the ones they did not. In the postcard Harold sent to his brother Percy, he mentioned the large anchor on Clarence Esplanade as being from ‘The Victory’. The HMS Victory, was Lord Nelson’s ship from the Battle of Trafalgar. The ship itself may have been in Portsmouth when Walter and Harold were there but it would have been in very bad shape (restoration would begin in 1922). I can’t find any record of it being on show at the time. Harold didn’t include any further explanation on the card; the name of the ship and the story of the Battle would have been a well-known story taught in history books throughout the British Empire. 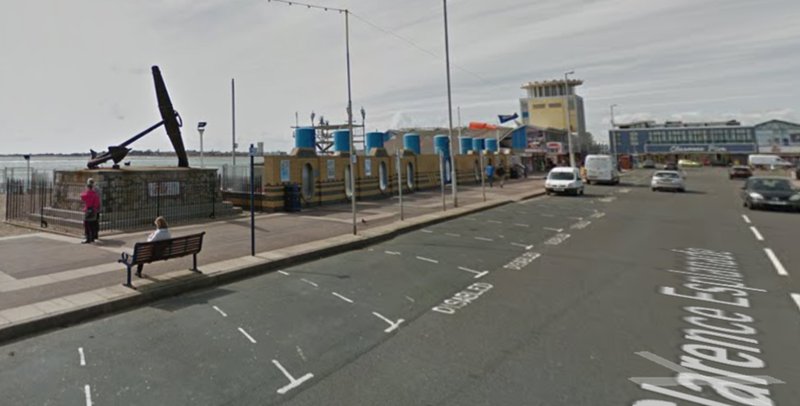 The Esplanade as it is today, below (Google street view). I intended to write about the other postcard from Portsmouth as well, but as I researched links to include about the city’s history, I experienced some personal explication I didn’t see coming. I’ll admit, it was a bombshell moment for me, but it explained a lot. In my original post, I wrote about my discomfort with the whole notion of war. I have always had an aversion of anything to do with it; I even skipped history classes at university when the topic was to be covered. I never stopped to reflect on why I felt that way. It just seemed natural — why would anyone want to dwell on such horrible things? As soon as I opened the National Museum’s website about the Battle of Trafalgar and saw the painting of the ships at battle, I felt shaky. I remembered something from childhood that I had completely forgotten. When I was seven, my mother, sister and I travelled to England to visit relatives. Mum took us to Madame Tussaud’s while we were in London and one of the exhibitions had been of the Battle of Trafalgar. It was (to say the least) a full-on experience. I remember the smell of gunpowder, flashes and the roar of cannons; the deck of the ship rocked and men screamed and groaned. They were covered in blood, slumped over guns, Admiral Nelson lay dying in another man’s arms. It was like walking through hell and it was terrifying. The memories that came back were vivid and charged, but were they accurate memories or the exaggerations of a small child’s over-active imagination? My heart was racing just thinking about the experience. I got back online wondering if the exhibition still existed or if there was any record of it at all. British Pathe had just what I was looking for and I’ll admit I had to get up from the computer the first time I watched the video. The exhibition opened in 1967, the year we visited, and the news footage shows all the preparation and work that went into making the exhibition an authentic replication. The final scenes will give you some sense of what the seven year old experienced. 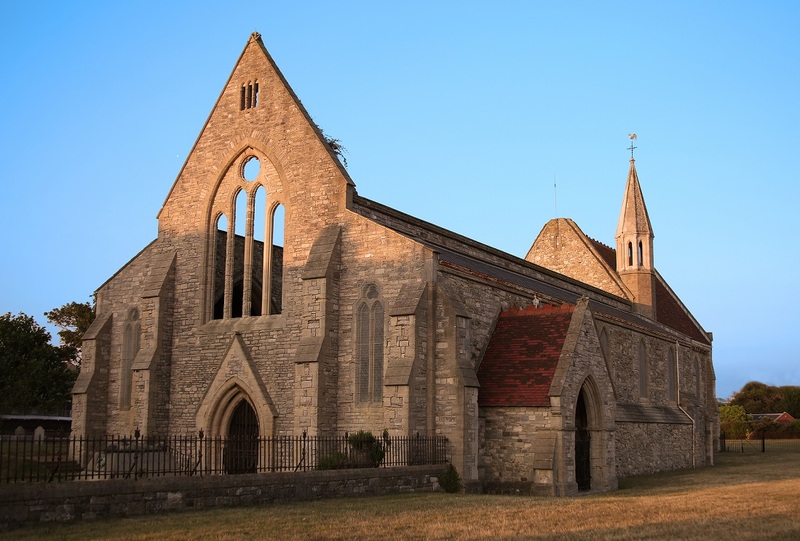 This entry was posted in Historical Perspective, Memories and tagged 1914, church, England, Nelson, Portsmouth, post cards, postcards, travel, Walter Cripps on July 26, 2015 by Catherine Hainstock. Catherine, you must return to Portsmouth and get a splendid memory! It looks and sounds wonderful. Definitely on my list for next visit. Oh dear Catherine, I can imagine as a seven year old being shocked by the sights and sounds. Your poor mother probably thought it would be a treat! Loved looking at the British pathe website… Great footage of the Netherlands (my fathers homelands). British Pathe is extraordinary! It never fails to amaze me what’s been captured on film. Yes my poor mum, I’m sure that visit didn’t go according to plan!